The much-beloved, but watched-by-few and cancelled-too-early show is a permanent part of our modern TV culture. One does not have to look hard to find examples of great shows that were unfortunately cut short or faced great hardship during their run, such as “Arrested Development”, “The Wire”, and “Firefly”, to name a few. However, I think Judd Apatow and Paul Feig’s “Freaks and Geeks” deserves special mention from this list of great shows. Despite being mature, well-written, and funny, it was unjustly cancelled only after 1 season due to low ratings. Running from 1999 to 2000, “Freaks and Geeks” was the first major role for many now-famous names; Jason Segel, James Franco, and Seth Rogen are all distinguished alumni of this show. “Freaks and Geeks” is the story of Lindsey Weir (Linda Cardellini) and her younger brother Sam Weir (James Frances Daley) and their trials and tribulations during the hectic, formative years of high school. Lindsey, a star student, tries to fit in with the “freaks”, a group of burnouts, after the death of her grandmother. Sam, on the other hand, tries to deal with his unpopularity and “geekiness”. Joining the two main characters are the titular “freaks” and “geeks”; Daniel Desario (James Franco), Ken Miller (Seth Rogen), Nick Andopolis (Jason Segel), and Kim Kelly (Busy Phillips) comprise the burnouts that Lindsey tries to befriend, while Neil Schweiber (Samm Levine) and Bill Haverchuck (Martin Starr) are the nerdy friends of Sam. Also present are Harold (Joe Flaherty) and Jean Weir (Becky Ann Baker), their well-meaning parents, and Mr. Rosseau (David “Gruber” Allen), a friendly but try-hard guidance counsellor. Although both main characters’ social statuses vary greatly, the core theme is that of identity. High school is often a formative period where people try on and discard parts of themselves, attempting to find their way into the world. The main characters are relatable, and that is one of the reasons that make this show great. Many other great shows portray characters in fantastical situations in which the audience would want to be: “Game of Thrones”, with its low fantasy intrigue, “Mad Men”, with the lives of advertisement men in the 60s, and “Breaking Bad”, with its tale of Walter White. However, the story of “Freaks and Geeks” is grounded and realistic, and exemplifies how our own apparently ordinary lives can still be full of excitement and drama. The audience, instead of having wish-fullfillment, can relate with the characters, which also allows them to be emotionally invested with the plot. In my opinion, Judd Apatow’s best works also carry this sentiment. Another aspect of the show that I love is that it tries very hard to flesh out every character, rather than descending into the tokenism that many shows about high school tend towards, especially for the time period in which the show was released. Again, the aura of realism permeates throughout the characters’ backstories. Without going too in detail to spoil anything, many characters’ home lives are explored with great candidness, some in stark contrast with the Weir siblings’ comfortable suburban life. Even the characters that seemingly appear to be harmless comedy sidekicks are explored deeply, and the darker undercurrents of their home lives are revealed; a lesser show would not even attempt this out of fear of alienating casual viewers and dropping ratings. Am I sad that “Freaks and Geeks” only lasted one season? Of course, but I am, to some extent, grateful that it didn’t last long. Had “Freaks and Geeks” not been cancelled, Judd Apatow may not have entered film, depriving us of “Anchorman”, “Superbad”, and “Bridesmaids”. Furthermore, one needs to look no further than “The Simpsons” to see what happens when a good show has its lifespan artificially extended. Perhaps this is a misguided sentiment, but the brevity of its lifespan gives it a certain mystique that other great shows, especially comedies, share. The concept of a brilliant show, struggling against the company politics of the network, but ultimately failing and being cut down young, is certainly romantic enough. 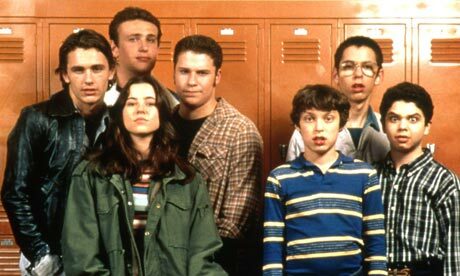 All in all, “Freaks and Geeks” is an honest, brilliantly funny, and all-around well done show, leading both its producers and actors to later greatness. I don’t think I can ask for much more than that.